AutoSpeed - Hearing Detonation – Upgraded! Back in 2014 we covered building a very effective listening device that would allow you to hear when engine detonation was occurring. That device has proved to be so successful that now we’re updating it to make it even better. The design is based on the ‘Listen Up Portable Personal Sound Amplifier’ that you can find from lots of eBay sellers from just $7. 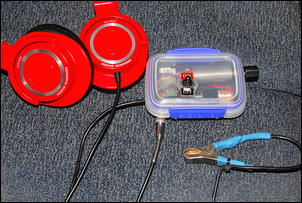 In the basic version of the detonation listening device, you’ll also need to add a decent pair of earphones or headphones, four metres of cable (eg shielded two-core microphone cable) and a battery clip. 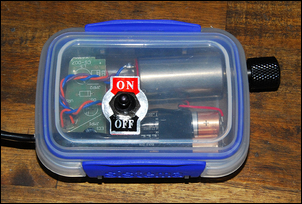 In the more advanced version, add to that an on/off switch, 10-turn 10 kilo-ohm pot, a new box and revised battery arrangement. 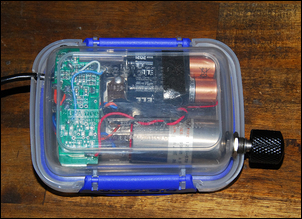 Open the box by first talking off the end caps (one covers the battery – a single AAA cell) to reveal four small screws. With it open, it should look like this. 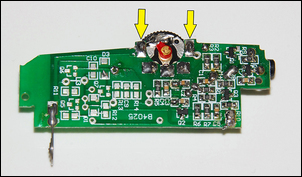 Note the microphone (arrowed) – both the fact that it is a large and relatively good quality unit, and that it is attached to the printed circuit board with flying leads. Unsolder the microphone and solder in place the new long shielded cable. Here are the new wires soldered into place. 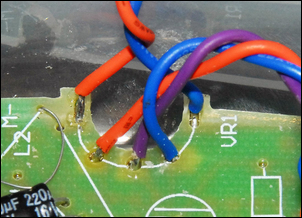 I also soldered the braid of the cable to the negative connection of the battery (arrowed), to provide better shielding of the signal. Make a suitable hole for the cable to escape and then close up the box. Solder the other end of the microphone cable to the microphone. Keep the polarity the same as original connections. 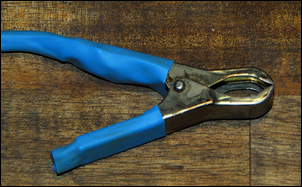 Use hot melt glue or similar to mount the microphone to the inside arm of a metal battery clip, then cover in heatshrink. High quality, fully enclosed headphones will work best – but any decent quality earphones should also be fine. With fully enclosed headphones on, the sound quality is excellent. The basic version described above works very well indeed – but it has some areas where it could be even further improved. Firstly, the single AAA battery, while having decent life, isn’t good enough if you’re doing a lot of tuning. Secondly, the on/off switch is incorporated in the volume switch and so you lose your volume setting every time you switch the device off. Finally, the volume control is very finicky to set to the precise listening level – and listening level is important when you’re trying to sort out different sounds. Our improved version fixes each of these issues. 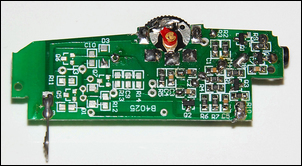 Please note that to build this improved version, you need slightly higher soldering skills than with the basic version, and having a solder sucker also helps. The first step in this version of the build is to remove the printed circuit board from the case. Take special note of the polarity of the battery connections. 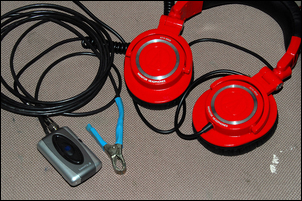 The microphone, microphone clip and microphone connections are then all made as with the basic version described above. Look carefully at the on-board pot. 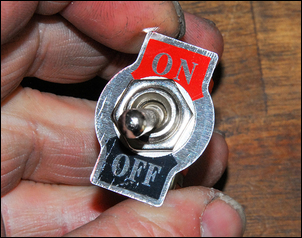 These two connections are for the on/off switch…. …and these three connections control the volume. 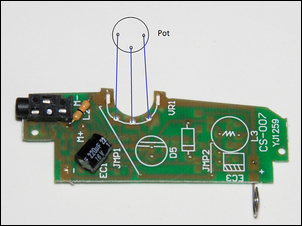 Using a solder-sucker and a soldering iron, de-solder the pot so it can be removed. 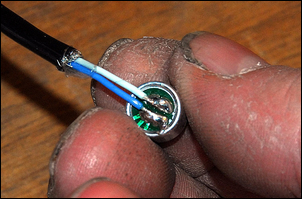 Carefully solder some short lengths of flexible insulated wire to each of the five positions – two for the switch and three for the pot. 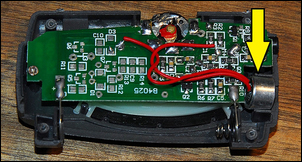 This view is from the other side of the board – the tinned wires have been pushed through the original holes and then soldered on the other side. The pot connects like this. If you find that the pot works the wrong way (ie volume falls when it should rise), just reverse the two outer connections. I used an impressively large multi-turn pot – but that’s just because I happened to have it. 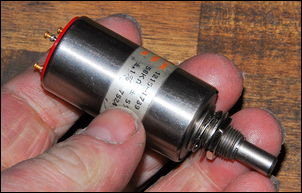 You need a 10 kilo-ohm pot, with as many turns as possible (eg 10 turns). A log pot would be nice but a normal linear one still works very well. You can use any knob you want on the pot. The on/off switch connects like this. 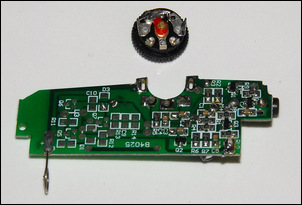 Because the system works at only 1.5V, it’s hard to add an LED to show when the system is switched on. I therefore used a switch with a large on/off tag. 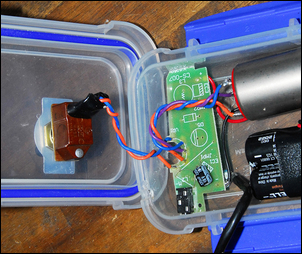 The next two steps are to build the device into a box, and add a better battery. For the battery I simply soldered two AA cells in parallel (NOT series) so that they provided the same voltage as original (ie 1.5V). 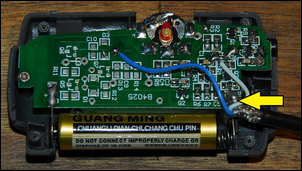 The battery is connected to the original power connections – the switch then turns the device on and off normally. (Make sure you keep the correct polarity – the + connection is shown on the board.) 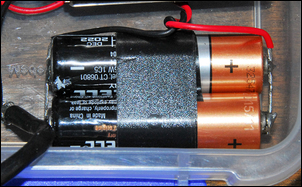 You’ll need to unsolder the batteries to change them, but two AA cells like this should last for hundreds of hours. The whole lot is then mounted in a small kitchen container. Note how the headphone jack (arrowed) has been aligned with a hole in the container wall so that the headphones can still be plugged in. 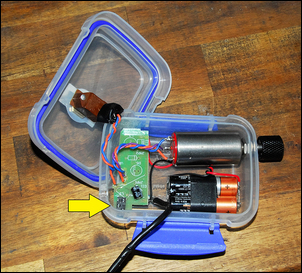 Using the detonation listener is very simple. You simply clip to the microphone to whatever you are interested in listening to. Noises are transmitted through the metalwork directly to the clip and microphone, making the device extremely sensitive. The 10-turn pot means you can set the volume level very finely – useful when you are trying to sort out different sounds. To detect detonation, the clip is best placed directly on the block, in the type of place that the factory knock sensors are positioned - no surprise there! 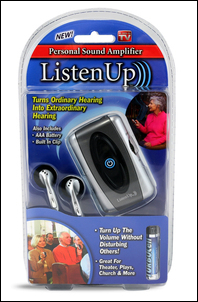 Adjust the volume control to give a comfortable loudness level, and sit back and listen. Over the clatter of pistons, valve gear, explosions and gearbox whines, detonation sounds like a sharp "splat!, splat!". However, the device’s functions are not limited to this alone. Setting idle speed is easier when listening to the engine because you can better hear hunting; you can use it to ensure that over-run injector shut-off is working; and you can also use it to detect if on-off vacuum solenoids are operating as they should. For its cost and effectiveness, this (along with a wide-band air/fuel ratio meter) is one of the best tuning tools you can have.